Get that little monster of yours into a toddler monster costume! Monster costumes were popular even before Monster, Inc. hit the movie theatres, but today they’re doubly fun. No longer does a monster have to be simply a scary, monstrous being; your little guy can be a monster in the spirit of Sulley and co, and go around spreading joy rather than fear. •	Do you want a generic monster costume, or a special movie character? •	How hot or cold will it be where your child will wear his costume? 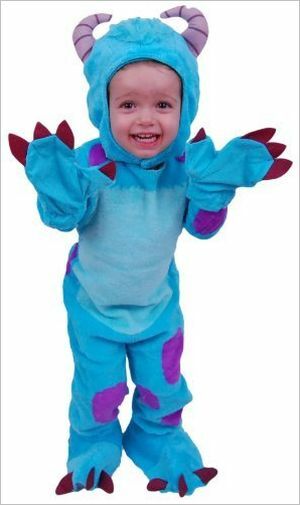 •	Is this a one-time event purchase, or do you want your child to be able to use his monster costume for dress-up in the future? If Sulley from Monster Inc., is what you’re after you can’t do better than go with Disguise Disney Pixar Monsters University Sulley. This is a jumpsuit with a removable tail, and it includes a hood, mitts, and shoe covers. Parents report it is a quality costume that can be used again and again; and there are just two negatives: the removable tail is only fastened on with Velcro and tends to fall off, and the sizing runs small. Remedy the first problem by sewing the tail on or adding a safety pin; for the second issue, just order a size up. While this monster costume is extremely cute, the headpiece seems lacking just a tiny bit of the mangy majesty of Monsters Inc. Sulley. If your toddler is old enough to no mind wearing a bulky mask around (say, 3+) consider buying him the Monsters University Sulley Monster Mask in addition to his costume. This mask definitely looks like the real thing, and for added effect the mouth and eyebrows move when your child moves his! Got toddler siblings? Why not put one of them in a Mike monster costume; then you’ll have the perfect pair. 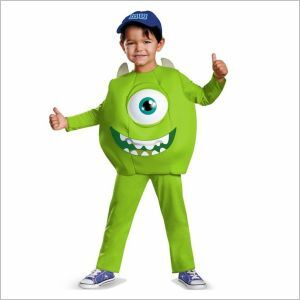 Disguise Disney Pixar Monsters University Mike Toddler Deluxe Costume makes a pretty effective Mike; it’s a jumpsuit with overlay and a 3D vacuform eye in the front. Though your toddler’s head won’t be part of his character, a MU hat comes with the costume as well. This jumpsuit is 100% polyester and tends to wear well; again, it runs small, so consider buying a size up. Rubies Fluffy and Me Muffy Monster is an adorable monster costume for a little girl. This costume comes in several parts; a very convincing monster hood, a pink dress, furry leggings, and a character purse. The only problem here is that the headpiece, being entirely separate from the rest of the costume, may not want to stay on; you may consider adding a ribbon or Velcro ties. Have fun dressing up your little monsters! You’ll want to do a test-run before the big dress-up day, be it a party or Halloween, to make sure you have everything you need and that you know how to adjust the fit (possibly with layers underneath). Then, when scare-time is really there, your toddler will be ready!